See below for various themes that are available for Wurlie. NOTE: Any themes that are purchased from sites other than Wurlie.net and MFScripts.com are created by third party developers. All support issues must be directed to the developer. 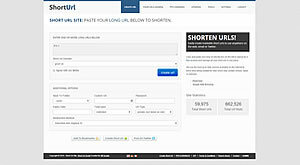 Wurlie V3 is the default theme for the short url script which comes as standard for free with the core script. Worlory is a slick colourful theme available for Wurlie - Short URL Script. Zampin Royale simplistic and eye pleasing theme available for wurlie.